Antique - Balmoral China by Redfern and Drakeford. Made in England in 1909 (the Edwardian Period). A Total of 34 Pieces are Included A full Service for (10) Ten. 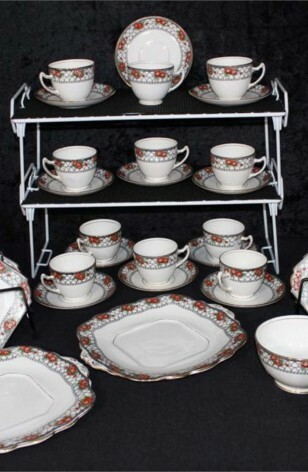 A gorgeous Hand Painted Balmoral China Tea Set, having a beautiful Red Floral Pattern on a White Background, with Black Arch, Chain and Stripes on the Lip. 22k Gold Trim on the Verge and Rim, as well as the inside Ring on the Cups and Sugar Bowl. This is a Rare and Dramatic Pattern from the Edwardian Period. Antique - Balmoral China by Redfern and Drakeford. Made in England in 1909 (the Edwardian Period). A Total of 34 Pieces are Included, a full Service for (10) Ten. 2 - Cookie Serving Platters - 9 1/4" x 10"